I was having a conversation a while back with someone who worked for an international hotel chain and she told me that their hotels in Europe don’t have alarm clocks in the rooms because Europeans – when they take their vacations – aren’t all that interested in keeping track of what time it is. We Americans, on the other hand, seem to have a need to know. Last Tuesday morning I was invited to the market in Vevey to meet and shop with celebrated chef Stéphane Décotterd of Le Pont de Brent. I guess I’m now European because when my alarm went off at 5:45am, I didn’t really want to know what time it was either. Our rendez-vous was planned for the unsettling hour of 6:50am, which meant I had to get up at least an hour before to gulp down a cup of coffee, grab something to eat, and check what happened on Facebook, Twitter, Flickr, as well as whatever happened in my e-mail, my RSS feeder…and my blog, during my sleep. In a rare lapse of normally exceptional Swiss service, the person at the hotel who promised the night before to have coffee delivered to my room at 6am – which I asked for because the dining room didn’t open until 7am and I pity anyone who meets me before I’ve had that obligatory first cup – didn’t get the message to the morning team. Having been on the receiving end of a few too many Gallic shrugs, I decided to take matters into my own hands and waddled downstairs in my bathrobe and spongy hotel-issued slippers to talk to the folks at front desk, who jumped to attention to help and made me a beautiful platter with a perfect cup of dark, dark coffee and a flaky croissant alongside. I’m not calling this an outdoor market, because as you can see, it pretty much is the acme of outdoor markets and to lump it in with all the others doesn’t do it justice. Resting on the edge of the gentle waters of Lake Geneva, with snow-capped mountains and the Mont Blanc rising majestically in the background, I can’t imagine a more spectacular location to shop. When I questioned the wisdom of getting up so early, chef Décotterd said that he had to get there first thing so he could get all the good stuff before everyone else did. And sure enough, when we arrived, we pretty much had the market all to ourselves. There were colorful Chiogga beets ringed with white and magenta colors, slender green leaves with a mild garlic scent called l’ail à l’Ours (bear’s garlic), morel mushrooms (which they chef loaded up on), leaves of colorful Swiss chard which reassured me to know that they actually do have Swiss chard in Switzerland, and teeny ratte potatoes that fit in the palm of your hand. 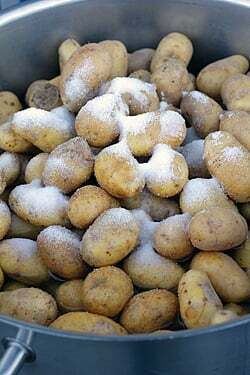 Even Europeans (and the fastidious Swiss), who normally wouldn’t think of eating a potato without skinning it first, resist the urge to remove the skins of these little fellas. As we left, the vendors and people who make the roast chickens and (unskinned) potatoes were just firing up their spits, but we didn’t have time to wait, so we headed toward the car. 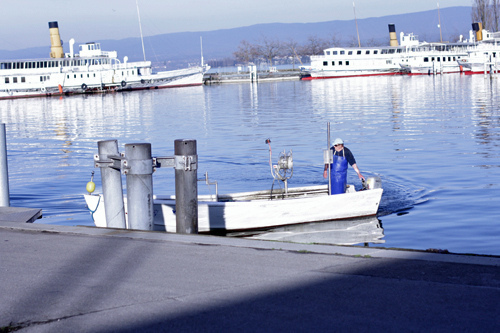 After we finished our shopping, we drove to visit the fishmonger whose boat (not boats, plural) was arriving from the lake. The fisherman sets out every morning at 4am and returns a few hours later, hopefully his nets filled with plenty of fish culled from the cool water of the lake. I don’t know if today’s haul was good or not, but tangled up in the delicate nets were small Féra (whitefish), Ombles Chevaliers (“dark knights”, or Arctic Char), Lotte (monkfish), and a few enormous Brochet, which when the fishmonger lifted up, released it’s contents on the dock. “You will have to Photoshop that out”, he joked, then laughed heartily. All I could say was I’ll bet he was happy he was wearing rubber boots. And tall ones at that. 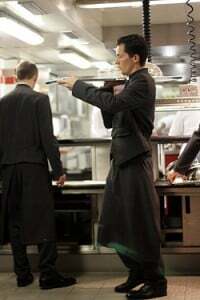 Since it was almost lunchtime, the chef needed to head back to the restaurant. But he said, “Would you like to go get the butter with me?” He may as well have said, “Do you want to stay in Switzerland for the rest of your life and shop at that market every week?” So we headed up to the mountains to the laiterie for the daily butter which get set on the tables at his restaurant. The drive took a lot longer than I thought, and when I saw that we made the trip for just thirty or so rounds of butter, I was surprised that he spent the time to make the journey up into the mountains just for butter. So I knew I was in for a treat when we drove back to the restaurant, to prepare for lunch. He headed to the kitchen, I, to the dining room. 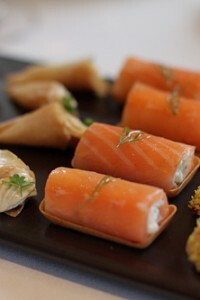 To find out about the meal the chef made, click to read: Le Pont de Brent. 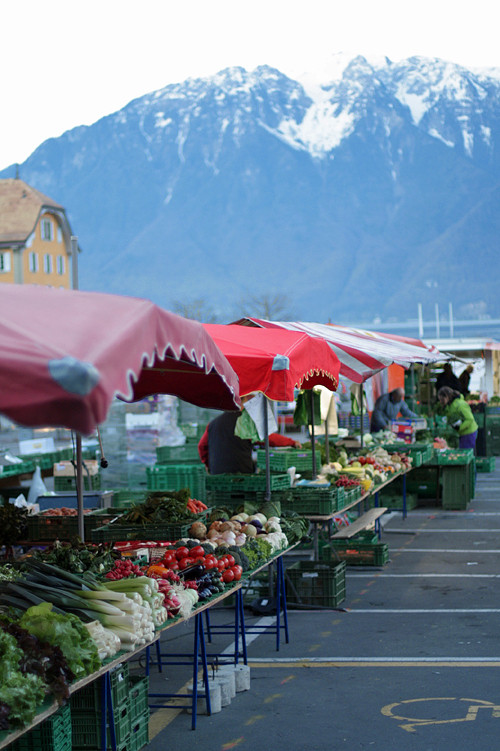 The Vevey Market takes place on Tuesday and Saturday mornings. Am waiting breathlessly for Part II… Hope I don’t pass out! What a lovely scene, those marketstalls against the mountains! And great produce too! Thank you for leaving me even more baffled and depressed by the low quality of most produce available in Paris. I’m going back to bed now. Those mushrooms? Chiogga beets? Wow. I am in total awe. Everything looks exquisite. 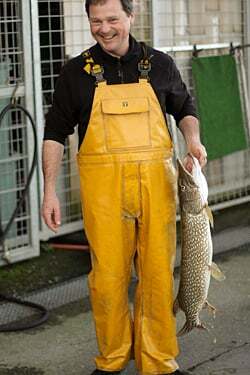 I’ve been reading ‘Eating Animals’ by Jonothan Safran Foer so it’s refreshing to get a glimpse of a real life fisherman. Looking very much forward to part II. those mushrooms look absolutely fantastic. i wish that boulder’s market was a little more varied like this (although i highly doubt i would buy fresh fish from a market in a land-locked state). I’m with Heather… that mushroom photo is surreal… the shapes and colors are just too perfect… what a morning to be able to shop with a mountain looking down on you! Oh WOW! Thank you for a wonderful post. 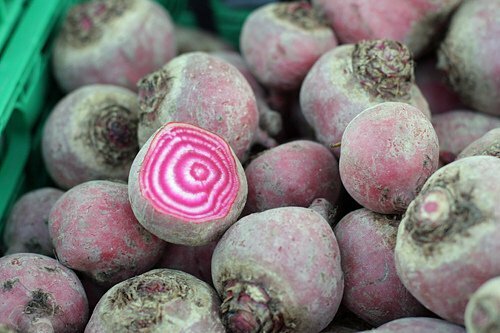 I want to say it can’t be beet, but I have a feeling Part II will be even butter! The only thing better than Vevey market is Vevey market in the middle of summer, when it turns into the Marché Folklorique. Every Saturday for 10 weeks, in addition to the normal market offerings, a different local vineyard showcases their wines under the big central pavilion. You buy the specially-marked wine glass for CHF 9 and then it’s free refills until 12:30 pm. There are flowers, a brass band, and a great atmosphere. We usually buy meat, bread, cheese, chocolate, and fruit from the market stands, plus a bottle or two of aforementioned wine and take it down the lake for a picnic once the market closes. It’s my absolute favorite place to be on a summer Saturday in Switzerland! Absolutely worth a return trip, David! This sounds magical…but you have my curiosity piqued regarding the fish that was unloaded from the boat. I had always thought that lotte was a saltwater fish. Is there a special freshwater variety? If so, that would be WONDERFUL – I had regretfully largely stopped eating monkfish, because of overfishing, but I am guessing that I can gaily tuck in again if I can find the freshwater version. Please tell me that I can be released from my lotte-largely-free existence: I miss it dreadfully! aggghhh….a cliffhanger! Can’t wait for part II. Part I was wonderful, & I want to go to Switzerland…I didn’t see anything like this when I was there. That market sounds like my idea of heaven! And fresh butter every day? What a dream!! That is one great market! I haven’t seen such beautiful mushrooms since moving to the States, when you see them at the market they are ugly and dry or too slimy. Amazing sight. Hope you get to try some of the bear’s garlic…I’m in Germany and my new favorite spring dish is to grind up handfuls with pistachio nuts and make a brilliant green pesto that keeps for days in the fridge. If you love garlic, it’s wonderful, especially topped with feta and tomato. My first time commenting…your blog is one of my favorites and I always turn to your recipes when I want to bake something and know it will be delicious on the first try. Keep up the great posts and enjoy the rest of your trip! morel mushrooms! mmm…dredged in flour, sauteed in butter….wanting some *so* badly! I love that first picture. The marketplace with the mountains in the back – wow – fresh ingredients, good food, clean air – that looks like a fun stop. Could I please just tag along with you??? I promise not to say a word! Or eat one bite!…….well…maybe just one bite! Waiting breathlessly for part II. I know that Americans call the the lake “Geneva’s lake”, but it’s not the true name ;). As I sip on my non-perfect cup of coffee, eating my non-swiss butter, and sitting at my desk rather than wandering through a mushroom laden outdoor market at dawn, I’m checking my redeemable airline miles to see if I have enough to cross the pond. This post makes me yearn for Europe more than I have in a long long time. Looking forward to part two!! Venturing into local markets is the best way to feel the pulse of the place. Can’t wait to see what the chef would be serving for lunch… The fact that he went out of his way to get the seemingly humble butter is prelude already to a sensational meal! What the heck am I doing in Kansas? wow! i cannot believe that setting, those mushrooms. and that butter. ugh! are those pickled mushrooms in that jar? i have not been to switzerland for years, now i am longing to go! Beautiful! Question: Why was it the “penultimate” market? Why not the ultimate? Is it because you know of another for which you reserve that title? Or because you’re always hoping for an even more spectacular version of whatever spectacular thing you encounter? Or because you harbor utopian fantasies? All/none of the above? I read every one of your posts with great interest – and needless to say love them. I live in Cannes only a few minutes from our wonderful daily marche Forville so I really do understand the lure of the French markets with goods picked just that morning. Ahhhhh, I’m so jealous! Thanks for the pictures, now I really want that butter! The market looks wonderful, but as usual in Switzerland it must be kind of expensive! By the way the dandelions in italian are called Denti di leone too, like in french! Tabasco & Kiki: I don’t know why you say that since the Region du Leman Tourism Office refers to it as “Lake Geneva”, as does Lausanne Tourism – ? Romy: I would love to go back. I’m going to be there in May with my tour, although because of logistics, we’ll be hitting the market in Lausanne on the same day. But appreciate the tip on the market…and the copious wine! Barbra: It was all quite stunning. It was so nice to see everything so fresh and so much local fare, which was quite a contrast. When we mentioned that to the people with the produce, they said, “Of course our things are local. We have wonderful produce here.” There were a few items that were obviously shipped, but not the majority, like in Paris. 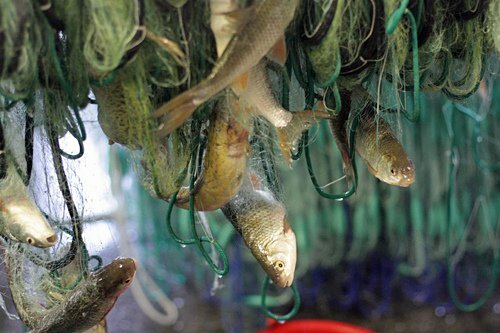 Vicky: At the fisherman’s market, he had a small monkfish that were caught in the lake. I took a few pictures but it was moving so fast once he removed it from the net, it was all blurry so I didn’t use it. Perhaps you can find a source for sustainable seafood where you are that can help you find some..
Rebeccal: I saw some cheeses in shops stuffed or seasoned with those leaves, but I did have them in a salad, just as they were, and they were delicious. I regret not bringing some home. This is where I grew up! Lovely to see it recounted through someone else’s eyes. It’s always far more romantic. We were here seven years ago for out honeymoon. Thank you for sharing these delicious photographs; brings back so many memories. Looking forward to Part II. That’s it; I’m moving to France. I can’t stand it anymore. 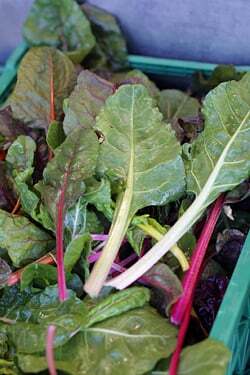 Looking forward to Part II, almost as much as I am looking forward to the spring vegetables to start rolling in. What a great place. I’m glad you could experience a wonderful spot like that. Hopefully I’ll get to see it someday soon as well. We have a farmers market close to the mountains here, but nowhere near as splendid as that. I tasted my first great food in my life when I studied in Geneva and Paris in a 4-month college program in 1967. This article is just wonderful and brings back all sorts of great memories. I still make raclette and fondue (adding truffles or morels, if I can find them), Swiss potatoes and enjoy fendant wine when I can find it. If I could only yodel. Keep up the great articles and photos. David from Seattle. This post brought back some exceptional memories. Especially when you mentioned “He may as well have said, ‘Do you want to stay in Switzerland for the rest of your life…'” I never made it to the market when I was there, but Vevey and Montreux, heck, the whole “Swiss Riviera”, is so beautiful it was hard to leave. Wow, makes me proud to be Swiss! But this is Vevey and I live in the other end of Switzerland in Basel, we enjoy going to Mulhouse to the market du canal ouvert or to Lörrach which hosts a genuine farmer market. Thanks for this lovely post and I can hardly wait for part II. Thanks for raising my serotonin this morning. Those mushroom and beet shots just gave me a natural Lexapro high! I wonder how many pics you have to take to get the final ones. I have a feeling not too many—some people just have the touch. Here in Kentucky we have a strange connection to Vevey. The first commercial vineyard in the US was planted in Kentucky around 1790 by a native of Vevey named Jean Jacques Dufour. The famous orator Henry Clay was a member of the so-called Kentucky Vineyard Society. The venture did not succeed in Kentucky, but Dufour’s family members moved west across the Ohio River and founded Vevay, Indiana. The wine industry in Vevay rebounded after Prohibition and still thrives. I just returned from the Ferry Plaza Market where the produce looked pretty much like what you saw at Vevey. I wonder if Bear’s garlic is what we call Ramps. Of course there was no snowcapped mountain, but the bay was lovely and sparkling. No cream today! Lovely fresh food I could easily sink my teeth into. Hmmm. I had to run in and out of 3 strip malls today all the while admiring the vista of a busy “highway”. I procured plastic wrapped snap peas from another continent, “fresh” meat sealed in plastic from yet another continent, and, well, the plastic wrapped cheese just didn’t inspire today, so I passed. Welcome to the USA. I can’t imagine why you like living over there. I mean, the photos you posted- has YOUR food passed the test of time and travel? I think not! I think I will make a better effort to playing the lottery these days. There are certainly farmer’s markets in the fair weather, but even in a beautiful supermarket, the produce is the same- imported. Even here in NJ, in the height of tomato season, it’s quite a challenge to actually buy a real Jersey tomato. While I appreciate berries in the middle of a dreary winter, I just wish it were easier to find local products in season. I will continue to live vicariously through your blog…. What a gorgeous post. The mushrooms, the beets and the little tiny potatoes – gorgeous! After 3 years here in Europe I am still obsessed with time. Just today I was walking in Luxembourg City’s pedestrian zone, grabbing lunch after my French lesson but just before I needed to pick-up my kids from school, thinking what this square needs is a great big clock!! One (American) can dream. Looking forward to Part II. Mostly the butter parts. I’m not going to lie. Such beautiful photographs. The first photo would be a beautiful painting.. Thanks for all the great posts and inspiration! Gorgeous photos David… splendid story and I’m a deep shade of pea green sitting here on my kitchen stool. oh my! that market looks so spectacular! and the fresh butter sounds amazing! can’t wait to hear about the meal! What an amazing market! Thank you for making me feel like I was there! Sob, sob, sob! You’ve made me cry! Rhubarb! I want rhubarb! I can forgive you the baby potatoes, the cheeses, the beets but rhubarb…I haven’t had a rhubarb crumble in at least 4 years…..not fair! Magnifique reportage sur ce superbe marché de Vevey! Je découvre votre blog avec le plus vif intéret! Merci de nous faire partager toutes ces merveilles. The really fresh food and f*cking nice pictures! I like it all! Good work! I was recalling, today, the weekly market in the village I lived in one year on exchange in the mountains of Indonesia, my first real exposure to the concept and then, later, the markets in Paris. Each, I suppose, has its own flavour, its own character. I can only say that I am so grateful that we in North America have, at last, adopted some form of an open air farmer’s market. I am jealous of your experience, but completely loved sharing it with you. Being at that market, with that exquisite food, and not buying what strikes your fancy and taking it back to your own kitchen to cook for family and friends. I have BEEN to that Starbucks you speak of in Vevey! Oh how I miss Switzerland! 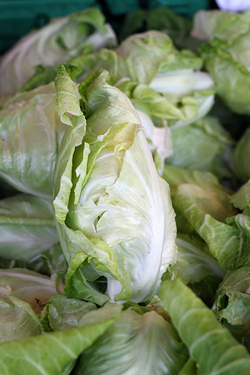 All the beautiful produce has me wishing spring would make its way to Chicago quickly. Can’t wait for part 2. Gee whiz, I don’t think we need the F-bomb in this kind of a blog. Oh… David. That photo of the mushrooms is HEAVEN! I know what you mean about dirty mushrooms – everywhere else in Europe (I’m in Italy) they sell the mushroom with the root and it’s dirt still attached. In a way they last a little longer than cutting it off (as that vendor apparently did in Switzerland) but the advantage is that the root will send up more mushrooms and if you’re growing them… isn’t that the point?!?! You are such a tease! But it’s totally worth it to get a look at the mushroom photos. L’ail à l’Ours! Thank you for adding another name to my growing list (so far I have collected Allium Ursinum L., Bear’s Garlic, Ramson, Wild Garlic, Ramp, Allium, Erba Orsina, Aglio Orsino and l’ail sauvage). This time of the year, the Vienna Woods are filled with the fresh garlic fragrance of this delicious spring green. Cooks all over town put it on their menus, creating ever more inventive recipes. I love to make Bärlauch pesto, using wild garlic leaves and walnuts instead of basil and pine nuts. 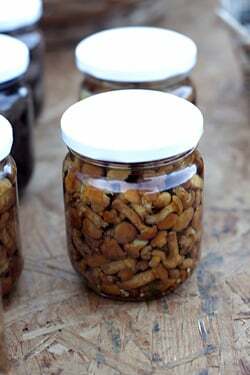 It tastes even better with pecans, but those nuts unfortunately are available here only in a state of staleness that has lost any of that sweetness that so nicely balances the heft of the wild garlic. I posted pictures of wild garlic in the woods last Thursday. Beautiful pictures. Who does your photography? These are cultivated mushrooms, grown indoors, aren’t they? 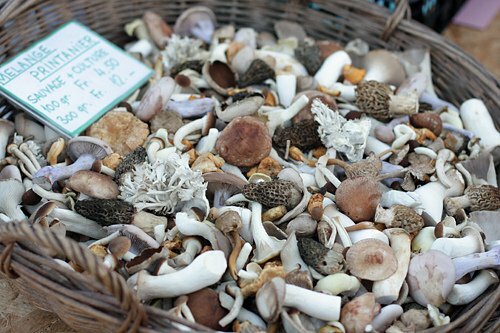 Plenty of cleaned mushrooms around Vienna’s markets! 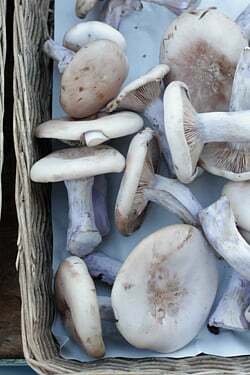 Wild mushrooms should be cut off above ground with a knife, taking care not to damage the mycelial layer growing underground (mushrooms don’t have roots). Alexandra: The butter was very, very good. Although I buy exceptional butter in France (Bordier) so it’s hard to compare. But this was very special and part of a lovely day. From a far…………those beautiful mushrooms look like sea shells………….. Thank you, wonderful artice and sweet way to start a Sunday morning…..
Très belles photos. Elles annoncent, par leur lumière et leur netteté, l’arrivée des beaux jours et des magnifiques produits que nous aurons à disposition. Rien de tel que les marchés pour découvrir la fraîcheur des produits. Hey David, I’m on the Geneva-Paris TGV and reading your post about Vevey was a very enjoyable way to pass the time, especially because I lived in Montreux until I moved to Paris 6 weeks ago. Lake of Geneva is the correct way to refer to Lac Leman in English, just as Genfersee (Lake of Geneva) is the correct way in German. I’m not sure why it’s only Leman in French. I loved your description of the market. It’s true that you can see lots of mountains from the market place, but not the Mont Blanc. It’s only visible after you pass Nyon or Morge going in the direction of Geneva. Have you been to a caveau yet? 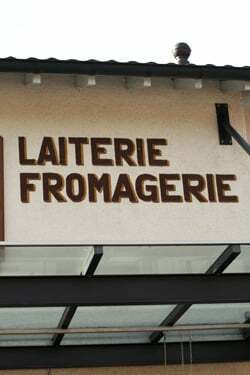 The one in St. Saphorin is close to Vevey, although it may not be open yet. Can’t wait to read the second part of the post about Vevey! Oh, how I love this post. 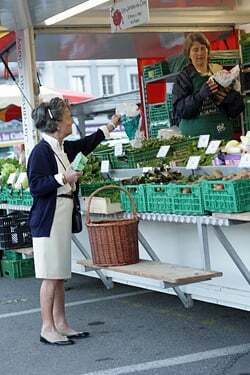 I adore the Vevey market and spend every Saturday morning there when I am in the area visiting my sister, some Tuesday mornings too. You have put into beautiful words and photos the love I have for the market. The next time you have the opportunity to be at the Vevey market you must try a savory salée from the bakers who are to the left of the covered market building. 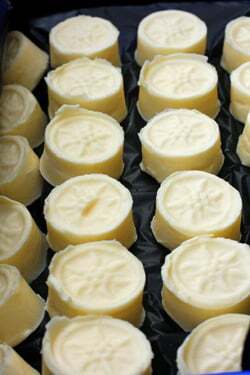 They sell them as individual tarts, slightly warm and they are heavenly. Just a block up from the market at 8 Rue du Theatre is a sweet spot for a coffee, tea and chocolate, Confiserie Poyet. I’m eagerly awaiting Part 2 especially for the info re. the laiterie. My regular laterie is the one in Blonay not far from Le Pont de Brent (a place that has been on my list to get to for some time). For the question someone had re. 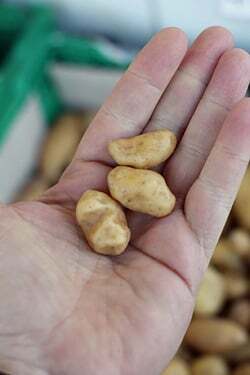 is bear’s garlic the same things as ramps, they are very similar but not exactly the same. They are a different species if I remember correctly and the taste is not exactly the same. My sister has bear’s garlic growing in her yard and the gorge where we hike is covered with it right now. If I get back there this spring I will pickle some so we can enjoy it throughout the year. Thank you for sharing your experiences with us. 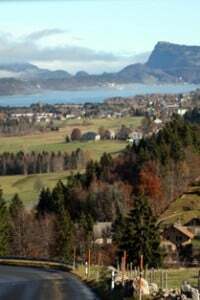 It tickles me to read about your time spent in the part of Switzerland that is so dear to me. Diane: I’ve been to Poyet and it’s a nice chocolate shop for sure. What a gorgeous market. Ours is in a pub carpark, near the railway line…. NOT beautiful. Can’t wait for part 2! I’ve passively followed your blog for some years now, it’s my favorite. But your photos from this post were so beautiful, the beets and mushrooms, that I couldn’t not comment. Aaaaah, beautiful. I’ve just sewn chiogga beetroot seeds, I can’t wait for them to grow. I hear they lose their pretty rings when cooked but are perfect for carpaccio. As ever, thank you for taking us readers with you! David, I don’t think I’ve ever wanted any food item as much as I want that mixed basket of mushrooms! SO lovely! Those mushroom and beets look amazing! hehe! gallic shrugs. very excited for part II. David, your photos are always stunning, but that overhead shot of the mushrooms is so beautiful I would hang it on my wall. I’m going back to reread the photographic advice you gave me in the vain hope that I can produce something like that. I’m waiting anxiously for part two…the produce-so beautiful. How lucky you are lead the life you do David! First time commenting after years and years of reading. Those mushrooms are killing me. I actually just joined the San Francisco Mycological Society and am going to go out for a morel foray soon. I just wanted to let you know how you have been one of my biggest inspirations for my own blog (and future career aspirations), in with your candid, passionate writing style and your bravery for just going for it in Paris. I aspire to do this too, but in Italy where I have family and studied for a couple years. Kudos and looking forward to the next cookbook. Yes, yes, the market, scenery, pictures, everything is beautiful. But i laughed out loud on the alarm clock comment….i just realized that, since moving to italy, i no longer own an alarm clock! david, you always get the cultural subtleties just right! and make me laugh. thank you so much for this blog. and, now I’m going marketing to our outdoor/covered market in La Spezia: the largest traditional market left in Italy. I love the Vevey market, however, being an Aussie in Switzerland, and living in Geneva, i have to say that our local market at Carouge, on a Wed and Sat is fabulous too. If you ever get a chance to stop in its the perfect saturday morning, wandering around with a hot (or cold depending on the season) ginger tea from the lady at the Cote d’Ivoire stand, perhaps a croissant or one of the great sandwiches from the young girl that sometimes has a stand or the lebanese stand that makes pita as you watch. Great fruit and veg, the local cheese guys have a stand too and the only place i have found beef saucisson! Laurian: I have to say, the quality at all the Swiss markets I’ve been too has been excellent and every time I go, I do a lot of shopping and bring lots of things back, including cheese, but also vegetables and other things. Just beautiful..
Susan O. I know. When I saw that basket of mushrooms, I think I took about 2 dozen pictures of it. I’ve never seen anything like that stand. Beautiful post!!! 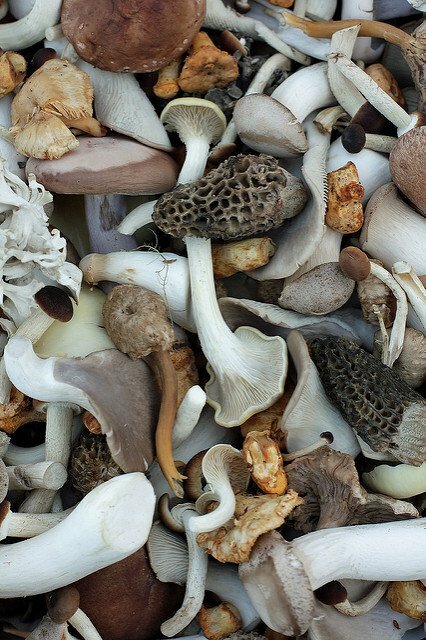 Love the mushrooms – do you know if the morels were wild or cultivated ?? (i thought they could not be cultivated)—and if they are wild, then hurray!!! morels season has started!! 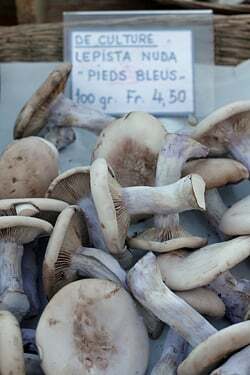 The ‘pieds bleus’ is called wood blewit in English. But I would love to see the photo of the monkfish – because it’s impossible that it’s from a freshwater lake. Fish and mushrooms are notorious for being corrupted and often have specific local names that might end up being wrong with direct translation . In the photos I can see a pike (brochet), a whitefish (specifically Schweitzer Felchen in German) and the tale of what could be a tiny perch…Sorry this is a bit of obsession of mine. maybe you could put the ‘monkfish’ on Flickr??? Incredible wild mushroom photograph… Can I buy a print of that some how? Danielle: Glad you like the photos. I don’t sell or distribute photos or other things from the blog because they’re all part of the stories that I’m telling and I prefer to keep them in context, within the site itself. Thank for asking! Simian: They told me it was a Lotte, which usually translates in English as monkfish, but may be slightly different, species-wise. Here’s a picture. 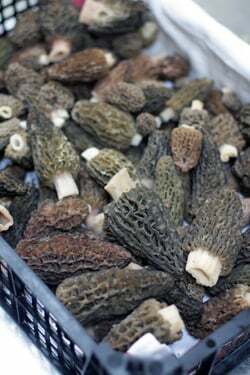 He had some morels that were cultivated, and others that were wild. For those of us in North America, the pictured brochet is more commonly called a northern pike. David thanks for posting picture -it’s a burbot- and indeed a fresh water fish and nothing like a monkfish. It’s lota lota in latin so maybe this explains why it’s can be confused with lotte /monkfish. Found some reference to it being called Lote de rivière in French?? (i don’t speak much french so can’t vouch for this). 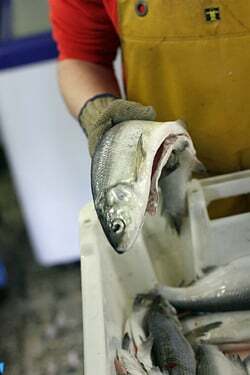 It’s the only fresh water fish in the cod family…so a bit like ling. And great news that the morels are out!! 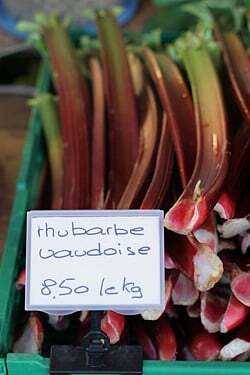 Thanks for a great post, I will be sure to go to the market the next time I visit my in-laws in Vaud!